A strategic partnership could be key to dealing with Indo-Pacific challenges. The Indo-Pacific region has been fraught with maritime issues, including an array of non-traditional security threats, notably seaborne piracy and terrorism – two salient challenges highlighted by Indian Prime Minister Narendra Modi when he addressed the valedictory function of India’s recent International Fleet Review. This warning came at an apt moment when regional waters have seen a recent spike in the number of piratical attacks and sea robberies. At the same time, the prospect of extremism and militancy spreading from land to the maritime domain constitutes a very real threat. But without a doubt, simmering tensions in the East and South China Seas have overshadowed reports of, say, pirates in regional waters. In the South China Sea especially, the situation has taken a turn for the worse. Between October 2015 and February this year, the U.S. Navy conducted freedom of navigation operations (FONOPS) while U.S. Air Force B-52 strategic bombers flew close to China’s artificial islands in the South China Sea. Washington’s show of force may perhaps forestall growing Chinese assertiveness, but there are already concerns over the evolving Sino-U.S. military power balance in view of China’s growing military capabilities, which contrast with the budget constraints faced by the U.S. military. One such example is the area of submarines. Between 2000 and 2014, China acquired at least 41 submarines whereas the U.S. acquired only 11. Moreover, Washington has seen its total number of submarines decline from 127 in 1990 to 73 in 2015. In February 2015, Vice Admiral Joseph P. Mulloy, deputy chief of naval operations for capabilities and resources, told the House Armed Services Committee’s seapower subcommittee that even though Chinese submarines are technologically inferior, Beijing has more submarines and is seeking to “to be in this world of advanced submarines.” The expansion of China’s undersea capabilities is part of the regional proliferation of submarines, which may constitute a source of destabilization when seen in the context of existing maritime flashpoints in the Indo-Pacific. ​Therefore, faced with the myriad of traditional and non-traditional maritime security challenges, coupled with the geopolitical uncertainties surrounding the shifts in the region’s military power balance, countries in the Indo-Pacific may need to prepare for the worst-case scenario in the longer term. In this respect, what kind of options do these countries have? To hedge against the growing uncertainties and evolving maritime challenges, promoting defense self-reliance, and fostering interstate cooperation become increasingly essential. While the U.S. has cultivated a network of allies and partners in the Indo-Pacific, the onus now falls on regional powers to share the security burden. In this regard, Indo-Japanese maritime cooperation becomes increasingly important. 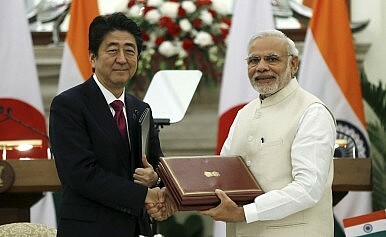 Recent years have witnessed expanding security links between India and Japan. This unique bilateral partnership began to blossom during the tenure of former Indian Prime Minister Manmohan Singh. Now under Modi’s watch, this relationship looks set to grow as an important part of the “Act East Policy.” A good example is that Indo-Japanese maritime joint training expanded from coastguard initiatives to the more recent Japan-India Maritime Exercise (JIMEX) series involving both navies; the first such joint drill took place in 2012. Strategic convergences enhance the Indo-Japanese security relationship. China is often cited as a common source of geopolitical concern for both countries, given that both have their own sets of problems with Beijing. However, often overlooked is the logical convergences stemming from mutual dependence in the maritime realm. On the one hand, India relies on uninterrupted access to sea lines of communications (SLOCs) plying the Western Pacific waters for the purpose of commerce and trade. On the other, Japan is dependent for its energy needs on the same access to SLOCs through the Indian Ocean region. SLOC security therefore constitutes a key driver of this Indo-Japanese nexus in the maritime domain. Southeast Asia is one such geographical area where India and Japan see their strategic maritime interests coincide, given their common interest in ensuring continued access to SLOCs through this region. Both countries have already started to assist Southeast Asian countries in building their maritime security capacities to cope with the evolving array of challenges at sea, in a way also helping Washington share the security burden in the region. To date, though, such assistance has taken the form of direct bilateral arrangements individually struck by New Delhi and Tokyo with Southeast Asian partners. If Japan and India were to collaborate, these initiatives may become even more effective and efficient through better coordination in providing aid and avoiding a duplication of efforts. At any rate, it appears that both India and Japan are viewing Southeast Asia as a region of increasing importance. During his recent speech in Thailand, Indian Vice President Shri M. Hamid Ansari placed the Association of Southeast Asian Nations (ASEAN) at the core of the “Act East Policy” and at the center of India’s dream of an Asian century. But an Indo-Japanese partnership in Southeast Asia will not make good headway without the involvement of ASEAN member states. Perhaps it may not be realistic to conceive of a broad India-Japan-ASEAN maritime partnership, given the diverse and sometimes conflicting interests amongst Southeast Asian governments. A “building block” approach may work better, allowing the parties involved to explore initiatives and gradually expand the scope of maritime cooperation in terms of both the substance and number of participants. One potential candidate to spearhead an eventual trilateral maritime partnership between India, Japan and ASEAN would be Singapore, a geostrategically well-located, small island-city state that is heavily dependent on SLOC security for its national survival and prosperity. Singapore also shares with India and Japan common ideas where it comes to upholding the international rule of law in governing the global commons. Equally important is that Singapore has long been a strong advocate for maritime cooperation. In this regard, it has leveraged its expertise and resources to aid in regional maritime security capacity-building. The creation of the Information Fusion Centre at Changi Naval Base is one such noteworthy example. Singapore has cultivated strong maritime security ties with both India and Japan. With the former, the strong links are exemplified by the annual Singapore-India Maritime Bilateral Exercise (SIMBEX) which has its roots back in the early-1990s. With the latter, the Regional Cooperation Agreement on Combating Piracy and Armed Robbery against ships in Asia (ReCAAP) is a noteworthy regional initiative. However, Japan and Singapore do not have a joint maritime training and exercise arrangement similar to SIMBEX. This may change in the longer term, especially as the Maritime Self-Defense Force appears keen to become more engaged in Southeast Asia, as seen for instance in a recent agreement for Japanese warships to call at Vietnam’s Cam Ranh base. As an active member within the ASEAN-centric regional architecture, Singapore could serve as an effective interlocutor for this growing Indo-Japanese partnership, allowing regional governments to tap their vast maritime security capacities. However, it needs pointing out that because Singapore does not participate in formal alliances, the eventual pathway to a broader India-Japan-ASEAN maritime partnership should not be seen as deliberately aimed at containing China. In this respect, Singapore’s traditionally close diplomatic, economic and sociocultural ties with Beijing can help in fostering confidence building and cooperation between these three Asian Great Powers in the maritime sphere, in a way helping ameliorate potential misperceptions. ​There is certainly considerable potential for both India and Japan to enhance and expand their existing maritime partnership, spawning tangible benefits to other countries in the Indo-Pacific region. To advance this partnership and maximize those benefits for Southeast Asia in particular – clearly the point of convergence for both New Delhi and Tokyo where SLOC security is concerned – Singapore can play a pivotal role in eventually establishing a broader India-Japan-ASEAN maritime partnership. But it needs to be emphasized here that such an arrangement should not be misconstrued as an alliance of sorts; rather, it would be part of a growing network of maritime partnerships that has proliferated throughout the Indo-Pacific. The underlying motivation ought to be primarily to safeguard freedom of navigation, which is so closely linked to SLOC security. In fact, such small multilateral (or perhaps “mini-lateral” is better) partnerships have already existed, for instance the Malacca Straits Patrol initiative between Indonesia, Malaysia, Singapore and Thailand. Another example occurred back in 2012, when India first established the National Security Advisor-level Trilateral Meeting on Maritime Security Cooperation involving Maldives and Sri Lanka. It was later expanded to include Mauritius and Seychelles. This form of “building block” approach in fostering practical cooperation in the maritime sphere is therefore certainly not alien. In fact, it might even be a more productive approach than huge, unwieldy frameworks involving too many actors and their diverse interests. To promote this tripartite maritime partnership between India, Japan and Singapore, the first logical move would be to establish a mechanism for trilateral strategic dialogue, through which the three countries can share information, better identify the maritime security capacity-building requirements of ASEAN countries and coordinate on ways to support such initiatives. This dialogue should also be premised on common principles, especially adherence to the international rule of law. Concurrently or in the next phase, it might be plausible to build on existing India-Japan and India-Singapore joint maritime training and exercises to eventually conceive of a trilateral arrangement involving both civilian maritime law enforcement agencies and navies. This aims at promoting interoperability and may even be a test-bed for evaluating the efficacy of existing mechanisms, such as the Code of Unplanned Encounters at Sea (CUES). Such nascent moves, if they succeed, could potentially be the first real step towards an India-Japan-ASEAN maritime partnership that contributes to peace and stability in the Indo-Pacific. Satoru Nagao is research fellow at The Tokyo Foundation. He also lectures on Security and National Strategy at Gakushuin University, Tokyo. Koh Swee Lean Collin is associate research fellow at the S. Rajaratnam School of International Studies based in Singapore.